Editor’s note: The original version of this post was published on May 8, 2013. Thanks Demian! Never thought I’d be so excited to see the phrase “the bathtub markers make it a home run” in a comment. But they work! So many great tips here! Had to laugh at the shower marker info, but also cannot deny the fact that more than one idea has indeed hit me somewhere between lather, rinse and repeat LOL. Next, I’m also glad that your main point is ONE. Just one. Hopefully, this advice will be the breath of fresh air that many people need and are seeking. There’s no denying the fact that there is a lot to do when you have a business to run and marketing to do. In my case, I help authors, so add writing a book to the list. You and I absolutely agree on the mission to get overwhelm out of the way as much as possible. Writing 5 or 10 minutes is okay. Really, it is. If you’re moving forward even a little, you’re moving and that’s a key to finishing any journey. You’re welcome Cheryl. Thank you for the comment! Nothing makes my morning more than someone saying “Thanks for all the inspiration…” That’s the goal! Good luck finding your ONE thing to focus on next. It may be a small step, but it can make a huge difference. Wonderful tips and inspiration– just what I needed to start my morning off with the proper writing focus. My best ideas, however, are not shower-born but rather when I’m out for a jog or a walk. For some reason the steady movement in my body releases thoughts and feelings. I rarely carry a pen and pad with me during those times, though. I have to rely on my memory. GREAT point! This happens to me too when I’m doing an elliptical workout, or even during yoga classes (I know, I know…I should be “present” and not thinking about writing, but it doesn’t always happen). I haven’t come up with a perfect solution for that yet. The best I’ve come up with is that I use my iPhone for music or podcasts while doing non-yoga workouts, so I can use the Note app to short-hand type a quick reminder. I often don’t though, so this is far from a good solution. Ahhh bathtub markers…! I’m floating in a tub of my own despicable demise. I tried the markers, but I’m still demising despicably. Great insights Jerod. I think a key idea here is to experiment to find what works for you. It means taking small risks by doing experiments that lead us to develop ourselves as effective writers. Some great practical advice here too. Thanks for sharing. Absolutely Justin! An overlooked benefit of the one-small-step method is that it’s easy to discard the new strategy if it’s not working and then move onto the next one. Sometimes learning what does NOT work is as important as learning what does. Bathtub markers – awesome idea. Even if it was just to feel like Russell Crowe in A Beautiful Mind writing equations on windows with grease pencils. Good tips. I think the most important is just to get started. Remember it you don’t have to get it perfect, just get it started. Too many writers want to start out as the next Hemmingway or even Stephen King. I am willing to bet that both of them had some pretty poor initial works. The timed writing sessions will help you just to get started. Tell yourself you are going to write for a certain amount of time. As Jerod says don’t proofread or reread. Just write. You might even find yourself going longer. When you are done, leave it sit for 24 hours, come back do some editing and then do another timed session. Trust me it works. Mike, thanks for the comment. And I have to say that “don’t proofread or reread, just write” is just about the hardest thing for me to do. It’s one mindset I am really trying to hone right now. The final product always turns out better when I do. Thank you copyblogger you do a great job helping guys like me. I am guilty of this too. I tend to be a perfectionist sometimes. The fiction writer Holly Lisle wrote she just pretends it’s fixed but it doesn’t work that way. What works is just writing down all the parts I need to fix later, because my need to edit stems from the fear I’ll miss something. I’ll just write the phrase I have trouble with or a specific problem like “X is too long” and move on. I love this. You gave me a great way to solve my Batch Processing issues. Thanks! Finally some unique and different advice! I’m actually going to try this stuff! I always want to sit down and write something, but I always get distracted or off track. Thanks for this! You’re welcome Sam! That’s exactly what I thought when I read the book. And makes a concept so difficult and intimidating – change – seem so much more manageable. Perfect, perfect timing. And perfect, perfect italics – yes, it’s fear – dagnabbit! Fear of what will come out when the pen hits the paper – or the fingers hit the keyboard. I gave a presentation on copywriting to a group of university interns yesterday and handed them a bibliography with my notes on at the end of the session – the comment after Steven Pressfield’s The War of Art read ‘I take no responsibility for the effect this book will have on your life. And you’re welcome.” This post is the perfect kick up the rear I need for myself and my own writing. Thank you. Thank you for writing tips that aren’t preachy. So often blogs about writing tips sound too much like disgruntled English professors giving their students a guilt trip. These tips are not only useful, but palatable. Thanks again. You’re welcome John. Best of luck taking your first step! Thanks for the great post. I have the hardest time with overusing adverbs. Great quote from King. I’m going to work intentionally to keep those little buggers under control. I love that quote from King. The first few times you write trying to be more judicious with adverbs, it’s quite difficult. It was for me. But now that I’ve been doing it for weeks, it is becoming more and more natural. Today I tried to explain this to a client who had written his own site. Your post will definitely help me back up my first draft for him. Very nice post. I just don’t know how my girlfriend feels about the bathtub markers. She may lock me up. Hi Jerod – Great article! Your advice is exactly what I’ve been looking for to revamp my writing. My favorite is your suggestion to schedule writing sessions each day. I only write when something comes to mind. So instead I’m going to try your suggestion and see what happens. Thanks for sharing! You’re welcome! And thank you. Writing sessions is a big one for me at present. It’s helping a great deal. Good to know I am not alone…I am constantly looking for ways to keep the creativity flowing which will keep me headed in the right direction as a better writer. Starting my time in the chair…NOW! BTW, King’s book should be an annual read for every writer, aspiring or otherwise. Thank you Jen. And I agree on King’s book. One of those that totally changed my perspective the first time I read it, and that I try to revisit every so often. Writing and blogging aren’t really separate. Jerod is saying treat your blogging as writing, not something different. Excellent tips and incredibly well-written. This post affirmed I’m doing some things “write” – but the one step I plan to implement today is cutting waaayyy back on my use of adverbs. Much better to use strong verbs instead. Thanks! Thank you Jennifer. Good luck cutting back on the adverbs. As I mentioned in a comment above, it was a challenge for me at first, as a former adverb addict, but it is getting easier and easier to the point of being (almost!) natural now. Really good tips here–especially your take on Steven King, who I believe is one of the Gods of writing today. As a writer (and blog writer), I follow his advice. Even more to the point, my book club recently read the book “On Writing” to have a better understanding of what makes writing work (or not work) in the books they critique. I think it’s a must-read for writers and readers alike, regardless of the format! Kudos to you for introducing him to a blogging audience! Thank you Linda! Agree. A must-read for both. Great advice! Especially the bathtub markers – brilliant! I think we should create an Instagram with just shower brainstorms by writers. Great advice really. I recognized some of the processes I used in order to improve myself, and am not sure why I never bothered labeling them. There is certainly a great deal of structure in progress to be noticed once we know what we are doing. The more techniques we are aware of, the better our craft. Thank you Slavko. Imitation is the most sincere form of flattery, right? So no plagiarizing, of course, but otherwise what writer wouldn’t want to be “stolen” from? Can’t tell u how much I loved and appreciated your article. Funny but my fiancé has gotten used to me dashing from shower to desk (with and without towel) saying shhhhhh the whole way so I could write down my thought. And even then I usually struggle to recapture all if it. So…While probably not as amusing your shower markers will definitely make a difference. Thanks!!! Thank you for the candid comment Stefanie. 🙂 I am very happy to help, but something tells me your fiancee is not going to be quite as happy with my advice. This is great, thank you! I started going to a coffee shop where the internet doesn’t work very well so that every time it goes down I start writing on a word document until it comes back up. Odd, but it works! Great idea Michael. Sometimes you just have to remove the distractions. I just put an app on computer that keeps me from going to certain time-wasting sites during the day. I’d like to say I have the willpower all the time, but I’m okay admitting weakness and finding a tool to help overcome it if it makes me more productive. I always struggle with adverbs. Here’s a tip I like to use: after writing a draft, do a search for “ly” words, and then do whatever you can to pull them out. Great idea Kenton! That’s an excellent method for doing an adverb-specific edit. Enjoyed the article – sometimes I think I’m the only one in the world who doesn’t get ideas in the shower! Nada. For me the trigger is being outside, especially walking in nature or at the nearby park. I keep a small handheld recorder in my pocket to keep track of all those “brilliant” ideas that pop into my head. Thanks for the inspiration! Great idea! My other typical place of inspiration it he car. I’ve started using my iPhone voice recorder to record great thoughts when they come. It’s easy to email the audio file to yourself afterward. LOVE this. I am buying bathroom markers today. What a great idea! Love the post too! Was just thinking about this for the last week. Thank you Danelle. 🙂 I hadn’t actually gotten my markers yet. Been too busy striking adverbs from my writing and focusing on timed writing sessions. But I ordered mine today too. Can’t wait to start using them. Thanks for the comment William. If you haven’t already, try emailing them to yourself right after you record. Then you’ll have the reminder in your inbox to transcribe. As long as modifications are done and credits are given to whom it is due. Very great article loved the main point! I know in the Bible theres a saying that tells us that focusing on the little things often pays off and benefits us with the big things. Very similar to what you said! Well hey, there we go! I really like point 2. When I write articles on paper / word outside wordpress I feel so much more at ease and I am really looking for the quality points to adds value to the reader. Daniel, you are so right. I enjoy both early morning and late night writing sessions the best. For me, those are the times when I find it the easiest to focus…before and after the constant onslaught of daily distractions takes hold. I get all my ideas in the shower! Loved this post. Need to execute! Especially the aqua notes!! Do it! Too much brilliance is being washed down the drain. We must rescue it. Great advice and some fantastic tips in there. Too often, we’re bombarded with hundreds of things we should all be doing to become a great writer, with the implication that you can’t even call yourself a writer unless you do all of them, every day. 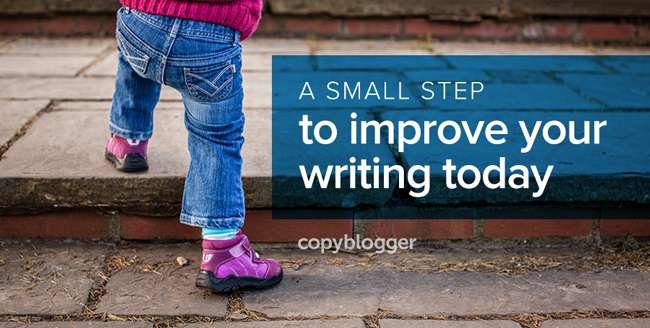 This is a refreshing change and it makes the task of becoming a better writer much less daunting – just one small change and you’re already well on your way. I’m sure that even great writers can improve by making small changes. To paraphrase Steven Tyler of Aerosmith, becoming a better writer is a journey, not a destination. I also love the idea of bathtub markers, by the way, but I’m not sure how my landlord would feel if it didn’t wash off. Thank you Anthony. Indeed, that is the beauty of the “one small step/change” mindset. Often one small change begets another, which begets another…and the journey of improvement takes you further than you perhaps even thought you were capable of going. I love the bathtub markers idea. Indeed, I do some of my best thinking in the shower but then the soapy water washes them away before I am through. I have also been working on something similar to Stephen King’s idea of less is more. Once I have written what I intended, I try to reduce the word count by 50%. Get to the point, will you! Thanks Marc. Let the soapy water wash your brilliance away no more! As a writer and a college instructor I’m not sure I agree with all of these points. I’m going to stick with King on adverbs. It’s okay to sprinkle them in, but overusing adverbs leads to sloshy slush. I also disagree with “stealing.” As a writer I certainly get ideas from others. As a songwriter in my younger years I constantly stole bits and pieces and attempted to be others. Now as the author of two books, “A Train Called Forgiveness” and “At the Crossing of Justice and Mercy,” I have found my own voice. It’s taken my years to get to the point where I do not steal. Not sure you read the “stealing” section carefully enough, Dan. Dan, I certainly agree that you don’t want to make a habit of stealing specific writing ideas or the “voice” of another author. I merely meant steal their habits for success. If a writer has achieved success through a specific mindset or daily series of actions, “steal” it and see if something similar works for you. Acceptance of multiple drafts seems to be a major step for me. I now try to get one sentence out after another, knowing that I will change things drastically. great stuff, breaking this down into simple reminders helps. I have been taking on lots of projects that have kept me distracted and getting back to basic helps. I am ripe to transition from blogger back to writer, focus on one things and save the links for later. I love the ideas of the makers too! It will give my husband reading material when she showers after me…wonder what he will think. He’ll think: “My goodness, I’m married to a genius!” (If he doesn’t think that already.) Because whatever is written on the shower walls will your unfiltered brilliance at its best! Hi Jerod. Great reminders to use the Kaizen way to take small steps. I keep trying to remind myself of that each day. I’ve given a lot of thought to the whole shower writing issue and have come up with the following hack: I bought a scuba diving underwater board (under $10 at Amazon) a couple of years ago and attached it to the shower wall with a suction cup. It comes with a built-in pencil but the pencil is useless because it writes so lightly and it’s impossible to erase. So I use a China marker to write on it instead. It makes dark marks and I’ve been able to write entire pages of stuff on the dive board. It comes off with a Mr. Clean eraser pad. I know this sounds like a lot of different items to use but for me it works better than writing on the wall directly, especially when you can write a lot using a relatively fine point. Julie, thanks for the hack! If the bathtub markers prove insufficient for anyone, these is a great next step to take. Great article. There are two steps I am going to take. The first is to schedule specific writing times. The second is to become more attentive regarding adjectives. Thanks for these valuable pointers. On the surface, the bathtub markers sound ridiculous. When you think about it in business terms (exactly how you explained it) it makes sense. Ideas that never come to fruition have a cost. I’ve had and lost ideas there. Haha, I thought this same thing (re: ridiculous). It’s why I almost took that section out before submitting. Except that, as you so succinctly explain in your comment, they are literally a way to lower costs! The cost of lost ideas. A case could be made that it’s the most costly* cost of all. * – adverb use approved. I know theres one thing I hate when I draft content. Noise. The tv must be off and I must be in a quiet environment. Hi Jerod – great post and glad to find I am not alone in writing in the shower/bath – dog walks another way of reversing writers’ block. Look forward to some more posts soon. Thank you Jawad 🙂 I used mine for the first time this weekend. They definitely helped! great idea found on this article – to write to a friend of mine- to type his name and explain him the subject of my post . thank you ! Thanks Anna! Glad you enjoyed it. I am an attorney. We live and die with the written word. I often died. My writing was too technically perfect for your run of the mill Judge to understand. Then I started to blog. Pumping out articles made me write in a much more conversational tone. I no longer consider myself a blogger, now I am a writer. I even write a column in our local bar journal. The same judge who never understood my legal writing has commented to me that my articles in the Legal Times are the only ones he understands and looks forward to. What a change! That’s some great advice. My favorite is “take one small step” because it applies to everything else in life (not just writing). For example, I’ve set a personal goal of earning a million dollars in 10 years and I find the task so overwhelming and daunting that one small step at a time is the only way to go. Good luck on your quest Lucas. That first step may be small, but it sure does have a chance to be lucrative! This is great advice, and something I could really use! I think one of my biggest problems, like you said is sitting there seeing that blinking cursor! It can be frustrating sometimes. One idea that I’ve tried to do is to just make a list of all of my ideas I’d like to write about. Creating a big long list, and keep adding to that list. Once I have a good list going, then I will sit down and pick a topic from that list I feel like writing about that day. This is something that has helped me. That’s a great idea Brittany! Using a prompt is always a great tool for attacking the white screen, and using your own prompt is even better. The bathtub markers are great. I’m one of those people that keeps a bajillion notebooks everywhere. This fixes the bathroom issue! I find that a lot of my inspiration hits during my daily walking routine. For this, I generally just use my Bluetooth to dictate to my phone and then just export it and clean it up. Sometimes, having to go back through the little bit of a mess the voice input makes brings out new thoughts or approaches that I missed the first time through. Yep, I’ve done the same thing with voice memos on my iPhone. The process of going back through is often illuminating in unexpected ways. Wonderful! I can certainly relate. My best ideas always come to me while sleeping, so I have a notebook right by my bed for when inspiration strikes. I also believe in your “writing” not “blogging” slant. When I write, I want to speak to my reader (as in your idea to write to a friend) and not speak at them. I hope this conversational tone comes across and I work towards making it do just that. I am fairly new to the blogging process (wrote my first post in August 2012), but my goal is always to strive to do better. Thanks Jerod for your inspiration! Thanks Jerod…and I definitely take inspiration where I can get it! Stephen King’s quote about judicious use of adverbs has changed my writing style forever. Now I get it. He used almost no adverbs in that paragraph but it is compelling as well. I’m on it. I really enjoyed reading this post: thanks for your contribution. However, if I were you, I would be careful about using such phrases as “hitting a home run” because most people in this world do not play American baseball. Consequently, they would be clueless when reading such a turn of phrase. Secondly, Kaizen means continuous quality improvement. I know about this because I have a PhD in Management. Kaizen means focus on one thing at a time and strive for incremental improvements: don’t try to change the whole world. Take it one step at a time and take your time. That compels you to focus. And once that happens, you are on the right track. Finally, it is important for writers to exercise the conscious mind. Later, however, you should allow the subconscious to take over. That is why hobbies and interests are so important. Once you are on that journey, the subconscious will work wonders and out will pour the answers you are looking for. It is almost like a miracle; has happened to me numerous times. I’m going to begin implementing these steps.